Siemens Industry Automation Division is launching a versatile weighing module for the Simatic S7-1200. Siwarex WP231 is the first weighing module for this control and is suitable for monitoring filling levels in silos and bins and for use with goods being weighed on platform scales. The new model is intended for industries requiring a high level of measurement accuracy, such as the food and beverage, pharmaceutical and chemical industries. Furthermore it is suitable for use in explosive atmospheres. Ethernet connections and an RS485 RTU interface with Modbus protocol enable it to be operated from a Modbus HMI panel without being connected to the Simatic S7-1200 control. Siemens’ new Siwarex WP231 weighing module can be fully integrated into the Simatic S7-1200 control, and its parameters can be quickly and easily set via the TIA Portal engineering platform. The module has four digital inputs and outputs and one analog output. 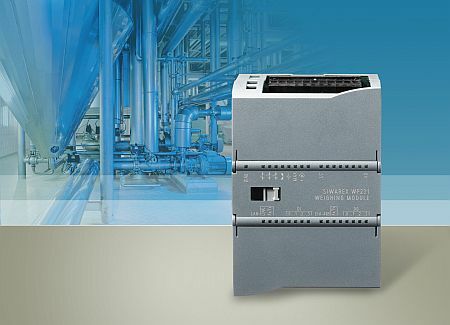 The Siwarex WP231 can be connected to various systems and operator panels via an Ethernet or RS485 interface with Modbus protocol and can be operated independently from the Simatic S7-1200 (“stand-alone capability”). This makes it possible for the module to be used in various applications. In addition, the module can be operated directly from a Modbus HMI panel in the event of failure of the control unit. Whether operating in stand-alone mode or in combination with the Simatic S7-1200, the Siwarex WP231 offers a wide range of settings for parameters and alarm management, thus enhancing process efficiency. Users can define specific limit values and different parameters for the various individual outputs. Additional diagnostic functions, such as the documenting of weight and various process parameter readings (Trace), make for greater transparency and facilitate the commissioning and maintenance of the module. Due to its high resolution – one million parts – and a measurement cycle of 10 milliseconds, the Siwarex WP231 is able to measure with a high degree of accuracy. Clear menus mean that the weighing module is easy to operate, whether in conjunction with the Simatic S7-1200 or via a directly connected HMI panel. Moreover, thanks to its automatic set-up function, the measuring system is ready to use within only a few minutes.